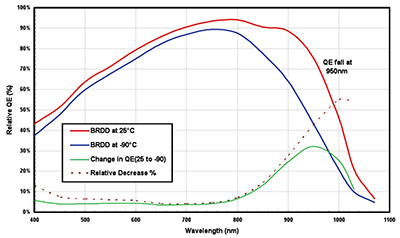 Figure 1: The relative change in QE for the BRDD sensor between 25°C and -90°C. A widely made assumption when looking for the best performance from a CCD detector is ‘the cooler the better’. An intrinsic source of noise within all CCD detectors is that associated with thermally generated ‘dark current’. Cooling is clearly the means of reducing this particular noise source. However, it is also very important to remember than the quantum efficiency (QE) has a temperature dependence, and in this case the QE actually gets worse with cooling. This is a very important consideration for some detectors when operated in certain spectral regions, where extending the deep cooling to ever lower temperatures can lead to non-optimised operation of the system; that it to say there exists some temperature beyond which further cooling can be a disadvantage. One such case is a back-illuminated deep-depletion (BRDD) sensor used in the NIR region from 750 nm to 1000 nm. The sensitivity of the fall-off in QE with cooling is depicted in figure 1 for a BRDD sensor. As can be seen the fall-off is quite dramatic and at the illustrated wavelength of 950 nm, the QE falls in relative terms by ~40%. This clearly arises a question around the trade-off between cooling to minimize dark noise and the desire to have QE as large as possible. To assess if there is an optimum temperature region for a given set of experimental conditions and what that temperature might be, it is useful to assess the SNR ratio possible at different temperatures of the sensor. The SNR ratio is the key parameter in any discussion on sensitivity. If we consider the system or camera noise as summarized in the equation below and illustrated for a typical BRDD sensor in figure 1 on page 51, then it is desirable to be operating at the noise floor (plateau at base of curves). But if we are working with exposures <1 s, as an illustrative example, we could work at a range of temperatures between -50ºC and -100ºC and still be operating at the detection limit. 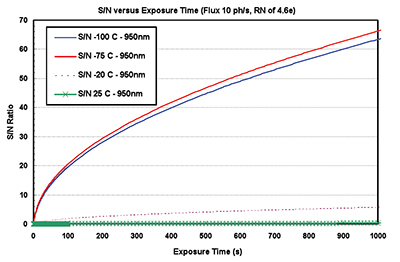 Figure 2: SNR versus exposure time for a low light photon flux of 10 ph/pix/s (950 nm) incident on the pixels of a BRDD sensor. The readout noise corresponds to the slowest rate of 33 kHz with a readout noise of 4.6 e-. The SNR is shown in figure 2 for a low level photon flux of 10 photons/pixel/second at wavelengths around 950 nm falling on a BRDD sensor. Generally as the sensor is cooled the SNR improves but interestingly at the lower temperatures the SNR is better at -75ºC than at -90ºC. This is indicative of the influence of the fall in QE and consistent with a transition point in the region of -70ºC to -90ºC where further cooling is disadvantageous to the overall sensitivity. The SNR characteristic is shown for this particular sensor being read out at the slowest rate of 33 kHz but the same trends apply for the characteristics if operating with the higher readout speed of 100 kHz with readout noise of ~16 e-. It is also important to note that even with longer exposure times the same trend is maintained and at no point does the deeper-cooled SNR exceed that at -75ºC. In addition, when dealing with stronger photon fluxes the SNR characteristics will be even more favourable to that of -75ºC compared with -100ºC. The inset in figure 2 shows in greater detail the SNR curves for short exposure times. From this example of working in the NIR region the degree of cooling must be considered carefully to ensure optimum performance in terms of SNR. In the case of the silicon-based BRDD sensor, ultra deep cooling as provided by liquid nitrogen can be a clear disadvantage when compared with deep-cooling in the -70ºC to -90ºC region. Thermo Electric (TE) cooling not only satisfies these requirements in a well controlled manner, but also avoids the inconvenience, cost and safety implications of working with liquid nitrogen systems. Figure 3: Dark signal characteristics for an InGaAs iDus camera where the dark signal depends on both the sensor temperature and the ambient blackbody radiation. The dark signal of the sensor is plotted at different temperatures for different ambient temperatures i.e. temperatures of the front end of the surrounding camera housing. The flat plateau regions correspond to background blackbody radiation limited detection. Figure 3 shows dark signal characteristics for the cooling of an iDus InGaAs (DU490A-1.7) array. These curves show the expected decrease in dark signal as the sensor gets cooler but they tend to flatten out into a plateau region beyond which further cooling of the sensor produces little or no improvement in the dark signal. A TE Peltier cooler is used to cool the sensor for the reduction of the thermally generated dark signal and a liquid coolant flowing through a copper block is used to remove heat from the warm end of the Peltier cycle. Consequently for these test measurements the coolant determines the ambient temperature i.e. the temperature of the camera housing (including window) surrounding the sensor. The characteristic curves for different coolant temperatures show that the dark charge becomes limited by the ambient blackbody radiation from the surroundings. In practice the blackbody radiation which can enter directly through the window from the surroundings will also be added to the overall background radiation. 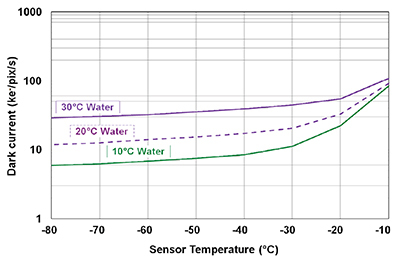 Figure 4: Variation of the relative QE of an InGaAs sensor with cooling. The solid curve is experimentally measured data at ambient (25ºC). The broken curves are modelled data based on both experimental measurements and theory, which indicated a shift in the band edge towards higher energies of ~0.75 nm/K and a drop in peak QE of the order of 0.1 %/K, with fall in temperature. Secondly, one has to be careful when measuring signals near the upper cut-off wavelength. As for silicon, cooling causes a shift in the energy of the bandgap edge; this leads to a shift in the cut-off wavelength. In InGaAs, increased cooling causes a striking shift of this cut-off towards shorter wavelengths. 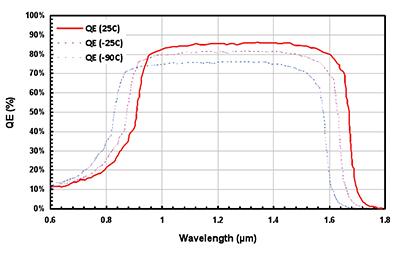 Figure 4 shows relative QE curves at several temperatures for the InGaAs sensor as used in the iDus DU490A-1.7 camera. This effect results in a shift dependence of ~0.6 nm/K that leads to a shift of ~70 nm to shorter wavelengths when cooling down to -100ºC. This effect is of extreme importance if one is working in the wavelength region around 1.6 µm. As with BRDD sensors working in the NIR region, one must consider carefully the degree of deep-cooling and the ability to control it, when ensuring optimum performance of an InGaAs system in terms of SNR. If using short to medium exposure times then TE cooling is more than adequate as long as the system is operating in a regime where the background dark signal is ‘ambient-blackbody-radiation’ limited. The latter is ensured with liquid coolant such that the camera is operated just above the dew point. If working at the upper end of the sensor’s wavelength sensitivity, e.g. around 1.6 µm, the accurate controllability of temperature will be a distinct advantage for optimization of sensitivity.